annie This is ridiculous! I'm done with FOX for good. How lame is it not to give us an ending? Pathetic. Alcatraz Season Finale Spoiler Theory: Is Rebecca Madsen dead or alive? Diane I certainly hope it is not possibility four. I love this show. It has so much potential to stay on for years. As others, she will live because of the silver in her blood. Sharma Yes Good story, but least Geology. From the title I was expecting Geology. All read here is a submerged hill!. Sorry. I see that Alcatraz is a surface remnant of an acretionary prism, accumulated due to the subduction of Faralon oceanic plate below North American continent, not sure on time-scale. 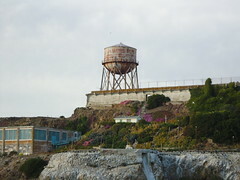 I was there last week, on a tourist trip to Alcatraz, and was very curious on Geology, on the road cut while going up. I took a picture. I am just curious on finding the geology, like I do in any other tourist spot that I go to. The beds are very steeply dipping (Probably SW~70 degrees, no measurement, just a hunch. These are very coarse grained sandstones (probably Feldspathic Quartites. (seems right in this story). Certainly these are turbidites and well bedded and laminated, alternating with 1-2ft shales, rhythemically at regular intervals! These are slope deposits of developoing acretionary prism. I will post some more when I find. Ed homonymous rocks? Mentioned twice. I couldn't find a specific definition. I concluded it meant that the rocks are given one name even though they are not identical. Alcatraz Spoiler: Is Lucy dead on Alcatraz?